The Gladiator team is committed to employing a highly trained team of Los Gatos copper repipe specialists who can take on jobs of any size or complexity. Our shop is found at 541 W Capitol Expy Ste 10-223, San Jose, CA, and is staffed by friendly team members who can assist with any of your plumbing needs. We can be reached at 408-649-7290, and we’ll be happy to answer any of your questions about your options. Our goal is to make it easy to have our Los Gatos repipe professionals come to your home. Call us today to get your job done as soon as possible. We want our customers to be completely satisfied with the jobs we do. By offering personalized services, we can ensure that our customers understand the scope of their job and are able to make informed decisions on how to move forward. We want to be the repipe specialists in Los Gatos that you trust on your property. Everything will be cleaned up when we’re done, and we’ll take great care to not damage anything. Our crew can help with copper pipe replacement in Los Gatos. We offer comprehensive copper repipe in Los Gatos and will make sure that everything goes as seamlessly as possible so that our customers can experience a high level of peace of mind. Any of your questions will be answered honestly and thoroughly so that you can be educated about the details of a job. We want to be the Los Gatos copper repipe plumbers you turn to for any job. By staying current with any changes to our field and local safety codes, we can stand behind the reliability and safety of our results. Our team will offer sound advice on your job and help you make the most of your budget. Our shop is equipped with all the tools needed to handle any type of job you have. 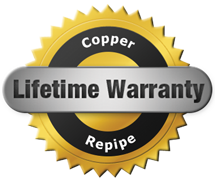 We can assist you with copper repipe in Los Gatos. We’ll make sure that everything is installed correctly and working perfectly when we’re done with a job.